He is so close Jane, its amazing isnt it. Right Jacque, your turn now, if Jane and me can do it, so can you, lol. It is a wonderful feeling to gain their trust. I've been trying with one of those that comes to my garden. It looks as though he wants to come for the mealworms on offer but he is still not sure. I hope so Jacque. He is getting a little braver. This fella showed a lot of interest as I was digging and seemed so bold . Almost sat on me waiting so Jane said put some mealworms on the bench so he came and ate them next to us .... Jane then got some real close ups of him totally unphased by camera. 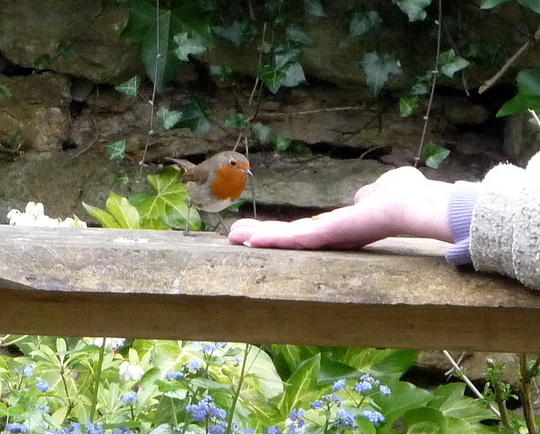 She then sat and moved the mealworms closer till left in her hand and he doesnt sit and eat but this only done since Jane been off from school work so - find a bold robin first as Dawn knows they wont all do this , but doesnt take too long with the braver ones ! Thanks Tg - think he must take the credit as quite keen to approach so didnt take long as so very bold . Dawn had a robin almost swoop on her as she went into the garden so some are much easier to persuade than others . This is reassurance for those who ask why cant I get my robin to do this ? You can treasure these little moments. I agree with BB - its the robin that finds you really - I've found his mate is very shy, she wont come anywhere close. Mine was like Jane's he just kept getting closer and closer and one day was by my hand as I fed him, a weird feeling - you sort of freeze. Regular feeding helps and of course the mealworms. Dawn,on reflection mine is the female as her partner has been popping up next to her and feeding her immediately after me.He has a brighter bib too ! Will have to wait until they start nesting to find out,once the eggs are being incubated ! Well, Well .... so there are tame males and females, no pattern there then. Jane here...Dawn we will just have to see. Just following my gut feeling here ! Don't know if you folks over there have the same adds on your pages as we do here in NA...but the add on this page in Canada is for Nixalite...a row of wire spikes so that birds will not lite on surfaces...I've seen them used at one of the grocery stores here in town...but I was a little offended...seeing your lovely heartwarming picture...and having that dangerous looking spiny thing advertised on the same page????? hmmm. How did that happen I wonder? almost forgot to congratulate you both! sorry for the digression... you must be special people...birds don't trust just anyone! lol. Wonderful pictures......I agree Bonkersbon Everything in nature follows through....to everything there is a season and a time to every purpose under heaven. Whether it's a large creature or a small one every one of them needs something to live off of and nature provides that if we let it. Her nest is getting bigger, but not much and very slowly. This is such a cute photo... robins are so trusting. I read the thread to find out whose hand this is. LOL. The story starts with the robin showing lots of interest while BB is digging .. Congrats. on your wonderful hands. as close as that, had a blackbird though sitting on a plant pot about 4 inches away from me today. She's in my shed Lindak. Thanks Dd and P the g welcome back to you Skippy ! What a lovely compliment for Jane , Flower thank you ..she often compares me to the dwarves Grumpy , Sleepy , Dopey ..
LMAO......, you are crazy, you realize that don't you ?! Please don't change either ! Each time I try Jane just ups the medication..
Smart AND a good sense of humour! : - } ! Thanks Sanbaz yes he was so bold and inquisitive started to sit next to us on the bench - so really he probably trained us ! Amazing, this is great ..... !!!! What a fantastic shot. Robins are so inquisative and they seem quite tame....and brave. Thanks Marydoll - the braver ones find you he started by following us round the garden whilst digging then spotted mealworms put out for him sat on the bench next to us then eventually hopped over for one. His partner very much more timid but nice to see them sharing think it a she as assume he will feed her whilst hatching. How I miss the north! Moved from NY to Florida 30 years ago. The beautfiul robins are here 3 days, twice a year. Once on their way south, and again on their way back north. But they bring back lovely memories for me. Travelled some years ago through upper New York State from Niagara Falls through Batavia so would have been close to or passed through East Ameherst ? Stayed at Indian Lake NY for a few days.